This postcard of Handsworth Wood station is well known but we would welcome comments especially regarding the coaching stock. So where and any other information you can give about the engines and surroundings. The train is a four-coach cove-roof Birmingham District Set, of which 30 were built from May 1904 to January 1907. The coaches are two brake-thirds with five compartments to D.338, a tri-composite (5F 1S 1T) of D.182, and one bi-composite (6S 2T) of D.285. Of course, the seconds were downgraded to thirds in 1912, and the bi-composites were renumbered as thirds accordingly. Just in case it isn't obvious, the white lettering of the station name on the sloping grass bank at the right has been added in the postcard printer's studio. 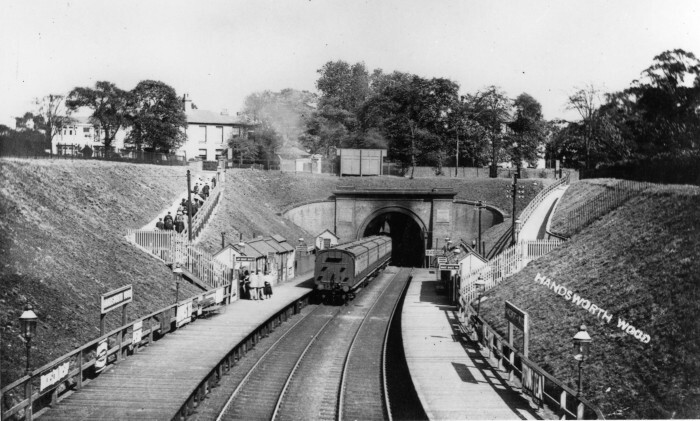 Reproductions of this same photograph, such as in 'Railways of the West Midlands - a Chronology' by C.R.Clinker (SLS 1954), have no such lettering, and other old photos looking in the opposite direction show nothing similar on either bank.